The Ticwatch Pro is now for sale on Amazon and you can view the price here. Right now it’s only available for Amazon Prime Members but you can get a 30-Day free trial of Amazon Prime and also be able to get those great Prime Day deals coming up on July 16th, if you’re not already a member. The Ticwatch Pro will be selling exclusively to Amazon Prime members until August 15th in the United States and UK. 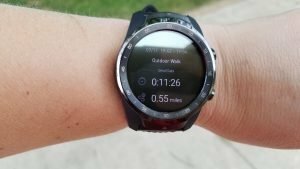 UPDATE: I received the Ticwatch Pro today and while I haven’t been able to test it out much just yet, I did go for a walk using the built-in GPS (I turned off location on my phone and was only using the built-in GPS of the watch) against the Garmin Fenix 5s and it tested out very well. The heart rate sensor did a good job too keeping up with the Fenix. I’ll need to do a lot more testing but so far so good! Much more to come in the review later. And in another update, I’ve done more testing of the built-in GPS and heart rate sensor and you can take a look at that here. As far as how I think the watch looks and its build quality, it does have a more premium look to it for sure. Be warned that it is a large watch and thick. It is 45 mm in diameter and the display itself is 1.39 inches. The watch is also 14.6 mm thick. However, I still find the Ticwatch Pro comfortable to wear, even on my smaller wrist. I’ve been able to wear the watch when sleeping and it doesn’t bother me and I thought it would. I don’t know what the screen is made of. I just haven’t been able to find that information so I’d recommend a good screen protector. Better safe than sorry but the bezel is raised some too so if you drop the watch and it lands face first the bezel should help protect the screen but I’ll still be getting a screen protector. It’s a large display that could easily be banged against something. Screen protectors for the Ticwatch Pro are available on Amazon. The strap is really nice. The top is made of Italian leather and the bottom of the strap which touches the skin is made of silicone with ridges for air flow which makes the strap very flexible and is good for letting your skin breathe during sweaty workouts or just hot days. The is 22 mm wide with quick release pins so it’s easy to swap out for a different one. Most watches I try I usually want to get a new strap fairly quickly but this one is nice. If I change it out, it’ll just be because I want a different look, maybe to add a pop of color, but not because the strap isn’t good. Really, it’s the best watch strap I’ve come across. The design makes a lot of sense. I’m surprised by the 5-30 day battery life claim because I was expecting 2-3 days. 5 days with mixed use beats every other Wear OS watch that I know of by quite a bit. Even if it only gets 3-4 days with mixed use, it’s still much better than the Ticwatch E and Ticwatch S. You can get up to 30 days if you only run the battery saving “essential” screen but more on that in a bit. Now that I’ve had the watch for a few days you can read how well the battery is holding up for me. The stumbling block of full-featured smartwatches has always been poor battery life but Mobvoi took an innovative approach in their dual screen technology. The Ticwatch Pro has the AMOLED high resolution screen that we’re used to but on top of it is another screen using much more energy efficient LED technology. Mobvoi is calling the AMOLED screen Smart Mode and the LED screen Essential Mode. After watching the promo video it looks like Essential Mode works well for when you’re working out. You’ll be able to see your health stats, such as your steps, heart rate, distance, and other data while you work out so Essential Mode isn’t dumb mode; it’s still providing useful information but saving battery life by quite a bit. Smart Mode is used when you want to use all those Google and Wear OS supported apps at your fingertips like Google Assistant, Google Maps, Google Pay, and of course your personal favorite apps. Mine happen to be View Ranger for hiking (it’s awesome! ), and streaming music services like Pandora and Spotify. 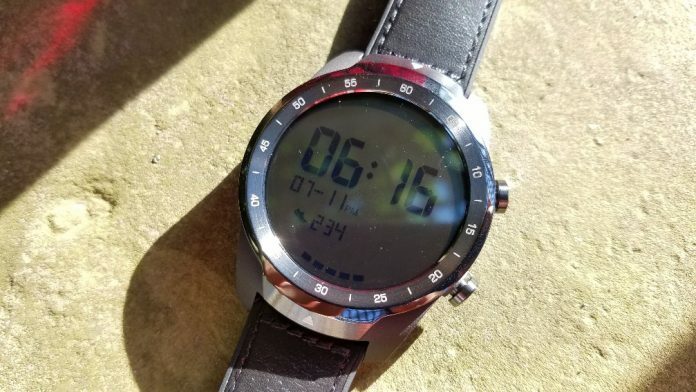 The Ticwatch Pro also has 4 GB of storage space for music that you don’t want to stream which is a feature most people are looking for in their smartwatches and/or fitness trackers these days. For some quick specs of the Ticwatch Pro, the display is 1.4 inches, and the AMOLED display has a 400×400 resolution, so it should be a good looking display. The watch weighs in at 58.5 grams. As a comparison the Samsung Gear Sport weighs 67 grams. The Ticwatch Pro has 512 MB of RAM and is equipped with the Snapdragon 2100 chipset. The watch also has a mic and speaker like its’ predecessors. So, you’ll be able to answer phone calls through the watch using Bluetooth, ask Google Assistant questions or give it commands to control smart features you may have in your house and reply to text messages with voice to text technology, at least for those with Android phones. No word on how all those features work with Apple right at the moment. What I’ve always liked about the Ticwatch 2 and Ticwatch E is that both offered fairly decent fitness tracking too. I’m really eager to see how the Ticwatch Pro has improved on fitness tracking. Is the built-in GPS truly standalone and accurate? How about that heart rate sensor? Has it improved? I’ll have to wait until I get my hands on it to answer those questions. Update: And now you can read about my first tests here. If you don’t want to read through another article, just know that the built-in GPS has tested out very well and is truly a stand-alone GPS. It doesn’t have to be connected to my phone like the Ticwatch E and Ticwatch 2 did. The Ticwatch Pro comes in two different styles, a black bezel and a silver bezel. The strap is made of Italian leather and the case of the watch is composed of stainless steel and strong carbon fiber plastic. This is also the first Ticwatch with an IP 68 water and dust resistance rating. What this means is that it can be submerged in shallow water, down to 1.5 meters for 30 minutes. So it’s not for swimming but if you accidentally submerge it in shallow water or get caught in a heavy downpour it should hold up well. The Ticwatch Pro is certainly more masculine in appearance than the more gender neutral Ticwatch 2 and E and S versions. I went with the black version but I kept going back and forth trying to decide which one I preferred. Since I have a smaller wrist I thought the black wouldn’t stick out as much as the silver, so I went with it. I’ll be sharing plenty of photos and uploading my version of an unboxing video. 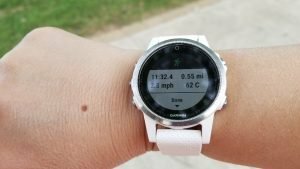 The full review of the Ticwatch Pro will come a few weeks later. I test all the major features (GPS, heart rate sensor, Bluetooth connection, Google Assistant, Google Maps, etc.,) multiple times so my reviews take a while but they are comprehensive. Anyway, you can take a look at the Ticwatch Pro right now on Amazon as it is now available for purchase to Prime Members until August 15th 2018. It’s not your budget-friendly Ticwatch E at Check on Amazon on Amazon but compared to other premium style Wear OS watches, it’s priced very well. When I heard it was going to be priced at less than $300, I was expecting $299 but it’s currently $249.99 at least for Prime Members. I don’t know if this is special pricing or the price it will always be. I’m excited about the Ticwatch Pro because if it delivers on its’ promises, other Wear OS watches are going to have a good competition on their hands. Oh, and by the way the next Samsung Gear S4, which will be named Galaxy, is apparently going to be running Wear OS too (Update: Samsung is keeping Tizen and why I think that’s a good thing) and will also measure blood pressure. There’s lots of groundbreaking products coming in the wearable industry this year and the Ticwatch Pro is the first one to be released. Who knows what Apple will bring us and Google is coming out with their own smartwatch too. Fun times!